You’ve got the records – now get ready to cheer on the football team. South London favourites Squeeze have teamed up with Lewes FC in a fundraising shirt deal. 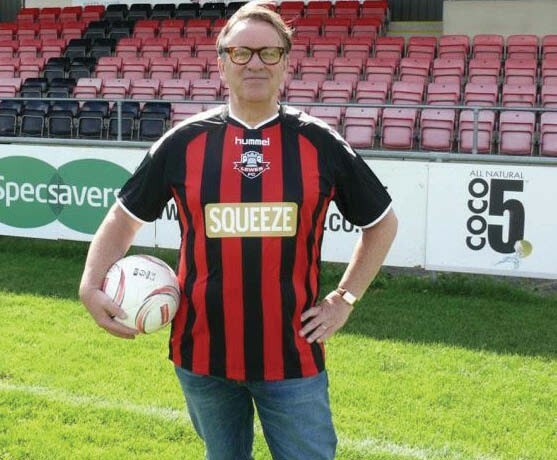 Singer and keen soccer fan Chris Difford showed off new kit featuring the band’s name at the club’s Dripping Pan stadium and explained, “Lewes is now my local club. Add that to the fact that this really is a people’s club, and we couldn’t be happier with the fit.” The band hope to help the Ryman Isthmian League club stay afloat by donating profits from sales of shirts instead of making a one-off sponsorship payment. The team’s new shirt is available to buy from the club website, and Squeeze’s tour T-shirts are also replica Lewes FC team shirts.